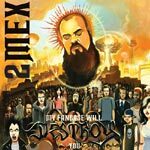 2Mex's (Visionaries/Project Blowed) Strange Famous Records debut! Loaded with ill production by the usual collaborative efforts of Deeskee, Busdriver, Nobody, LD, Ikey Owens, and more! Quite possibly the hardest working man in Los Angeles, this hip hop veteran has been blessing us since the Good Life Cafe days. My Fanbase Will Destroy You is an album that embodies an accumulation and recollection of the last 15 years of work he has put out and if you count it all up you will find well over 50 albums and releases with all his sidegroup affiliations and projects from Of Mexican Descent, Xololanxinxo, $martyr, Songodsons, Look Daggers, Shapeshifters, Mind Clouders and more. Not to mention probably hundreds of guest appearances and counting. Featuring Murs, Prince Po, Maleko, Busdriver, Rifleman, Riddlore, Ngafsh and more! Heavy rotation here at Access! Produced by Busdriver (tracks 1, 8, 9 & 12); Ikey Owens & Deeskee (2); Deeskee (3, 7, 13 & 15); Life Rexall (4); Ceschi Ramos (5 & 10); LDONTHECUT (6); DJ Nobody (11); and Single Helix (14). Cuts on track 4 by Buddy Peace.